Atopic Eczema, otherwise known as Atopic Dermatitis or Infantile Eczema is a chronic relapsing itchy skin disease. 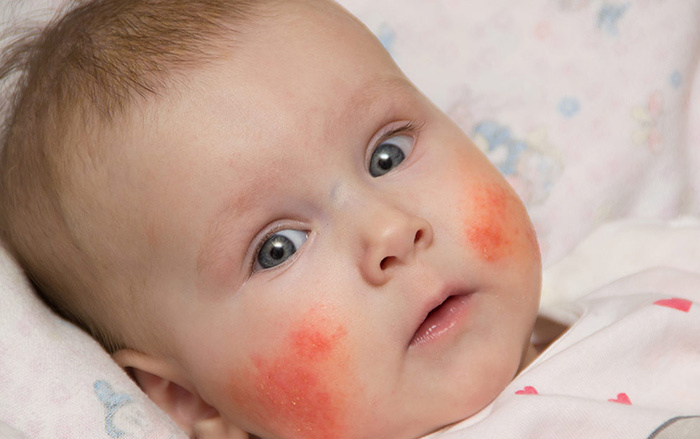 Atopic Eczema is usually the first clinical manifestation of allergy in atopic families. It usually commences about the third month of life as a weepy rash on the face and outer surfaces of arms and legs and then progresses in later childhood as a dry scaly and itchy rash commonly of the inner creases of the elbows and knees. Some children may not outgrow their eczema and the condition can persist or recurs in adulthood. General allergy prevention measures will help in high allergy-risk newborns. These include avoidance of parental smoking during pregnancy and after birth, breast feeding until at least 4 to 6 months of age if possible. Common allergy-provoking foods such as cow’s milk, eggs, fish, peanuts, wheat and soya may be avoided in the breast-feeding mother’s daily diet (but proof that this helps is lacking). Avoidance of solid foods in babies up to 6 months of age followed by the careful introduction of the potential allergy-provoking foods one at a time over a period of weeks. These allergy risk foods include cow’s milk, wheat and egg, nuts and fish. Up to 25% of infantile eczema is aggravated by a food allergy and food additives or colourings can also aggravate eczema in older children. Skin irritation from pseudo-allergens in acidic citrus fruits, tomatoes, pineapples, berry fruits, cheese, chocolate and Marmite, occurs in patients with eczema. These foods and tropical fruits may also cause peri-oral and contact facial irritation. We discourage hit-and-miss elimination diets in children with their potential for malnutrition. Children should avoid hot humid environments and cold dry weather, sweatiness, woollen or synthetic clothing close to the skin and perfumed lotions and soaps. Cotton underclothes, clothing and bed-linen are recommended. Dry winter air and house dust mites also aggravate eczema. Non-biological washing powders are best and avoid enzyme enriched products. Give an additional rinse cycle to remove all washing powder. Bubble baths, household cleaners and medicated soaps should be avoided. Swimming pool chemicals and chlorine may also irritate and dry the skin. Common household skin sensitizers include detergents, woollen goods, man-made fibres and feathers. House dust mites, pet dog and cat dander may trigger eczema. Bath water should be lukewarm and fragrance-free moisturising emollients must be applied to the skin within a few minutes of patting the skin dry (never rub to dry the skin). Avoid all detergent soaps, shampoo and bubble baths, rather using plain aqueous cream or emulsifying ointment as a soap substitute. Add Oilatum Plus, Aveeno a colloidal oatmeal and/or liquid paraffin to bath water. A capful of Dettol or Jik in the bath will reduce skin colonisation with bacteria. Cover as much skin as possible with low-allergy light-weight cotton bedclothing, taking care not to overdress or overheat the child. Cotton night mittens may help stop scratching as well as neatly clipped fingernails will reduce skin damage. Sometimes arm splints need to be applied to stop severe scratching in the sleep. Avoid all woollen and synthetic clothes. Young eczema-prone adults should consider a career which is less likely to expose them to irritant chemicals. Particularly avoid nursing, hairdressing, chef, catering, motor mechanics, or the construction and building industry. Protective gloves with cotton inner-linings will reduce irritant contact dermatitis, so common in eczema sufferers. Emollient moisturising creams and ointments (the greasier the better) are the basis of eczema treatment. They are very safe and plenty should be applied to the whole body often (every 4 hours if necessary). This will effectively hydrate and protect the skin. Occasionally people may find that one or other of these preparations will irritate their skin due to a preservative or fragrance. If this occurs try another alternative product. Good emollients include Emulsifying Ointment, Vaseline, Petroleum Jelly, Epimax, Cetomacrogol etc. Sometimes coal tar extractare applied to treat very thickened skin. Aqueous cream is a good soap substitute but not a good emollient. Apply plenty of emollient a few minutes before applying the steroid creams, as this will facilitate absorption of the steroid. Prescribe adequate amounts of emollient, at least 250g per week for children and 600g per week for adults. Topical skin steroids cause rapid relief and when used no more than twice daily for short periods (of 5 to 7 days) will clear eczema. They can be used for longer periods by diluting the steroid in any emollient (emulsifying ointment) in which case treatment can be tapered off over a longer period. Long-term steroid use may lead to thinning of the skin and pigment changes. The latest preparations seem to be less likely to cause side-effects (mometasone & fluticasone). Steroid fear or steroidophobia is a big problem and always leads to poor eczema control. Treating the eczema more aggressively at an early stage may reduce further eczema exacerbations by “disciplining” the skin. Hydrocortisone 1% is suitable to use on the face but is too weak to treat eczema on the limbs and body. Taking cortisone tablets every second day may occasionally be necessary in very difficult to treat eczema. Eczema sufferers are prone to skin infections such bacterial, fungal and viral infections including the common viral wart. Topical antibiotic skin creams (Fucidin & Bactroban) or Chlorhexidine 5% solution in the bath and occasionally oral antibiotics (Flucloxacillin) are prescribed to treat severely infected eczema. Topical antibiotics can be added to emollients and steroid creams to eradicate Staphylococcal colonisation. Always suspect an infection when there is a sudden deterioration in the eczema with crusting, weeping, oozing and generalised skin redness. Take a skin swab to identify any Staphylococcal and Streptococcal skin infection and remember to treat the nose as bacteria are harboured there. The older more-sedating type antihistamine tablets or syrup such as chlorphenamine (Allergex) and phenergan and atarax will reduce itching especially at night. Antihistamine creams may sensitise the skin and paradoxically cause allergies so should be avoided. Once daily non-sedating antihistamines may have both anti-itch and anti-inflammatory properties (for example cetirizine, loratidine, fexofenadine). They should be use continuously at night for several months. Medical studies show that continuous use of cetirizine in early life prevents the “Allergic March” from eczema to asthma and urticaria (called the ETAC study). Applying damp tubular elasticised bandages and occlusive dressings to the limbs at night improves skin hydration and the absorption of moisturising emollients and steroid creams. This is most effective in severe childhood eczema on limbs with oozing and crusting. First apply the steroid ointment then plenty of moisturizing emollients. Two layers of elastic tubular bandages are applied over each limb. The inner layer is made wet to aid absorption of emollients while the outer layer remains dry. Lots of unsubstantiated alternative eczema therapies are promoted in the press. Be wary of these claims. Miraculous natural cures for eczema often contain crushed cortisone tablets. Evening Primrose oil (or gamolenic acid), flaxseed & omega 3 oils offer no real additional benefit to eczema. Chinese herbal tea extracts have been evaluated but taste unpleasant and may even cause liver toxicity. Recalcitrant eczema on the face may respond to non-steroidal immune-modulator preparations such as Tacrolimus (Protopic) and Pimecrolimus (Elidel) however skin redness may be a temporary side effect. Ultra-violet light therapy treatment has been helpful so get out into the sunshine! There is growing proof that lactobacillus GG probiotics (Reuterina) supplemented in pregnancy, breastfeeding and early in life may reduce eczema in babies by altering their gut immune reactivity.